I was thinking of going to see Paul McCartney in Rio next month, or at least going online at midnight to try and buy a ticket. I’ve seen almost everyone I ever wanted to see live, with the exceptions of The Clash and The Jam, the former of whom I missed only because their 1982 (or was it 1983?) gig in Edinburgh was cancelled. I reckon I might never get another opportunity to see the greatest Beatle of them all so I was prepared to go all the way to Rio and even to pay over the odds for the privilege. I had no idea how much over the odds. The full page ads in the newspapers don’t tell you how much the tickets cost. Maybe they’re too embarrassed to put the price. They should be. Because the cheapest tickets in Rio are $150 reais (not including the massive booking fee). That’s almost $100. 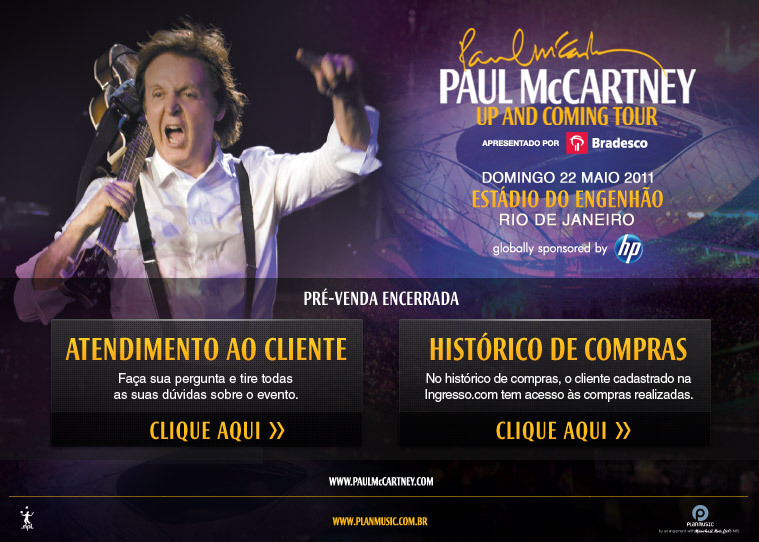 In Chile the week McCartney before plays Rio, tickets are on sale for the equivalent of 75 reais. In Lima, two weeks before he plays in Rio, Peruvian fans will pay a minimum of around 127 reais. Even in Toronto, Canada, the cheapest tickets for last year’s gig there were the equivalent of 94 reais. In other words, Brazilians are asked to pay much more than elsewhere. Why? Part of the reason is that so many Brazilians use student IDs which gives them 50 percent off. One recent study showed that more than two-thirds of people but tickets using the discount. Of course, many of them are fake. Another reason is this: Brazilian ‘celebrities’ are bussed in, given tshirts, free food and drink and then allowed a first row seat in front of the real fans. Or they are ensconced in a comfortable executive box. No matter how marginal their fame, or how they ‘achieved’ it, they’re there. Hundreds of them. A few of them were photographed at the U2 concerts in São Paulo last weekend. Edmundo, for example, a retired footballer who killed three people while driving drunk in Rio in 2004. Maureen Maggi, a long jumper who was banned by the IOC for testing positive for steroids. Two sons of former President Luiz Inacio Lula da Silva. Fabio Assuncao, an actor who was such a big U2 fan he left before the show ended.